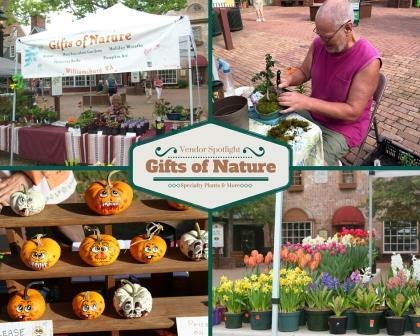 Started in 2001, by their mother Violet, Gifts of Nature is a family business that has been selling flowers and plants grown on their three-acre property in York County. Sister Mickey runs the business end of the operation while brother Wally, who may not be able to talk or hear you, has a talent of turning miniature succulents into small dish gardens, junipers and pines into bonsai and one-gallon shrubs into hundreds of rooted cuttings. Nature is seasonal so in the spring customers love the tulips. In the summer, it is the bonsai and succulent gardens. The autumn has people looking for the painted pumpkins and the winter brings live wreaths and table center pieces. Nature is amazing as it truly is a gift! Sister Mickey loves being at the market, meeting wonderful people and making everyone happy with the beauty of nature!